"The scientists' role in the crystal growth process is that of an assistant who helps molecules to crystallize. The scientific challenge is to learn how to intervene in the process in order to improve the final product." Crystallization refers to the formation of solid crystals from a homogeneous solution. It is essentially a solid-liquid separation technique and a very important one at that. Crystals are grown in many shapes, which are dependent upon downstream processing or final product requirements. Crystal shapes can include cubic, tetragonal, orthorhombic, hexagonal, monoclinic, triclinic, and trigonal. 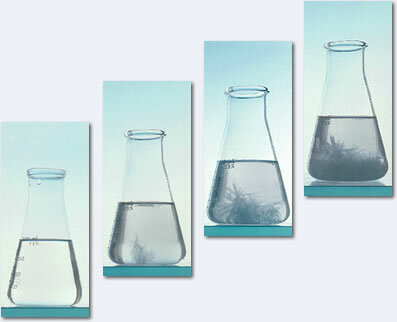 In order for crystallization to take place a solution must be "supersaturated". Supersaturation refers to a state in which the liquid (solvent) contains more dissolved solids (solute) than can ordinarily be accomodated at that temperature. So how do you grow crystals? Let's consider an example that is fairly easy to envision. Take a pot of boiling water and add table salt while stirring to make a water-salt solution. Continue adding salt until no more salt will dissolve in the solution (this is a saturated solution). Now add one final teaspoon of salt. The salt that will not dissolve will help the first step in crystallization begin. This first step is called "nucleation" or primary nucleation. The salt resting at the bottom of the pot will provide a site for nucleation to occur. Primary nucleation is the first step in crystallization. Simply defined, it's the growth of a new crystal. On an industrial scale, a large supersaturation driving force is necessary to initiate primary nucleation. The initiation of primary nucleation via this driving force is not fully understood which makes it difficult to model (experiments are the best guide). Usually, the instantaneous formation of many nuclei can be observed "crashing out" of the solution. You can think of the supersaturation driving force as being created by a combination of high solute concentration and rapid cooling. In the salt example, cooling will be gradual so we need to provide a "seed" for the crystals to grow on. In continuous crystallization, once primary nucleation has begun, the crystal size distribution begins to take shape. The second chief mechanism in crystallization is called secondary nucleation. In this phase of crystallization, crystal growth is initiated with contact. The contact can be between the solution and other crystals, a mixer blade, a pipe, a vessel wall, etc. This phase of crystallization occurs at lower supersaturation (than primary nucleation) where crystal growth is optimal. Secondary nucleation requires "seeds" or existing crystals to perpetuate crystal growth. In our salt example, we bypassed primary nucleation by "seeding" the solution with a final teaspoon of salt. Secondary nucleation can be thought of as the workhorse of crystallization. Again, no complete theory is available to model secondary nucleation and it's behavior can only be anticipated by experimentation. Mathematic relationships do exist to correlate experimental data. However, correlating experimental data to model crystallization is time consuming and often considered extreme for batch operations, but can easily be justified for continuous processes where larger capital expenditures are necessary. For batch operations, only preliminary data measurements are truly necessary.